In the last post we looked at what to consider when tidying up your blog. Of course some of you might be moving on from tidying up and into some major renovation work, such as changing your blog’s theme. Is it already very widely used? This may or may not bother you. Some people don’t care if their blog looks similar to other people’s, whereas others really want to stand out as much as possible. 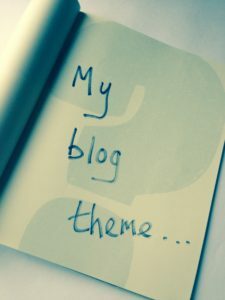 With many millions of blogs currently active online, you’ll probably share your theme with at least one or two others. Even if you use a very common theme you can still make it your own by adjusting the colors and layout etc. And of course, nobody will ever have exactly the same content you do. Many people these days will be reading your blog on a smartphone or tablet. If you have an older theme on your blog then it might not be configured to be easily readable on a smaller screen. To check this, simply look up your blog on a smartphone and see how it appears. If the posts aren’t readable then you definitely need to change your theme. If people can’t read your posts, they won’t stay. Do you prefer a magazine format? As the name suggests, a magazine format is the opposite of a traditional blog format and looks much more like… well… a magazine. This is useful if you want your blog to look more professional. If your blog is just a fun hobby then you might not care so much. If it’s the first step in your mission to rule the world then it might matter to you more. You’ll need to have decent photography skills or access to good photos if you’re going with a magazine style because the pictures tend to be larger and more of a feature. Do you want all of the post to show on the home page or just a snippet? Having snippets of lots of posts on your home page can be a good way to engage new readers because they can easily see at a glance what sort of things you write about. But if you don’t have many posts to show, or you don’t post very often, then showing all of the post on the home page can work better. Readers can then scroll down to read it diary style. Many full-time bloggers put a LOT of effort into their blog theme, with professionally designed banners and customised social media buttons. But there’s really no rule that says you have to do all that stuff. Creating your blog theme can be a wonderful exercise in creativity, design and furthering your technical skills. So have fun with it. If you’re not sure, keep it simple and enjoy the fact that your blog is yours to play with.